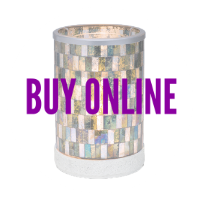 The serene beauty of the ocean, captured in the ripple of mosaic glass, with hues of blues, greens, and and iridescent whites, this beautiful Ocean Mosaic Scentsy candle warmer will bring you to the relaxations and breezy reminders of the sea. 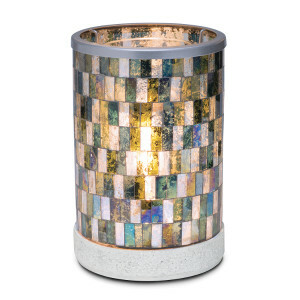 Ocean Mosaic Scentsy warmer is 6″ tall and uses a 25-watt Scentsy lightbulb. Scentsy Candle Warmers are the flagship product of Scentsy fragrance. A unique system, Scentsy uses a low-watt light bulb, or warming plate, to gently warm the candle tarts. This process of melting wax at a low temperature maximizes the strength of a Scentsy bar and the life of the scent. Scentsy Bars are never “burned” because they are wickless. Each candle bar will last up to 80 hours of “on” time.